Does Jewelry Make you Look Younger? So…does jewelry make you look younger? No. That’s the short answer. But you know what jewelry does do? It adorns you and makes you feel more beautiful…which can in turn make you feel younger. Jewelry also is a form of self-care (stick with me for a second). When you decide you are a priority, you are able to gift yourself. You believe you are worthy of beautiful things. When you’re able to honor yourself to that extent, it radiates…and makes you look younger. On a practical level, jewelry can enhance your most positive features. Those blue earrings bring out the sparkle in your eye. That blingy engagement ring elongates and enhances your pretty hand. That necklace shows off your plunging neckline. When you enhance your best features, guess what happens? You look younger! Jewelry also provides a sense of history. 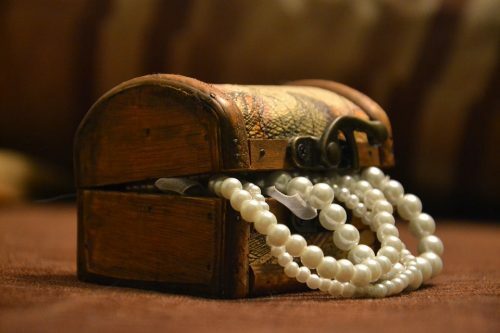 Pieces in your jewelry box may remind you of your first boyfriend or your mom’s gift on your wedding day. When you realize the personal history behind you, you feel…okay, older. But really, why do you need to feel younger anyway? Embracing your life as it is now provides the deepest sense of feeling good. So opt for that. Let the jewelry be the icing on the amazing cake that is you! We talk a lot here about the powerful element of sparkle when it comes to gems. It’s that visual dazzling effect that flies off off a diamond (for instance) when light hits it. But did you know that you can sparkle without the enhancement of jewelry? That’s right: eyes sparkle…but how? The primary reason why the eyes “twinkle” is that when there is a momentary partial closure of the lids – this squeezes the tear film (the very thin layer of a highly specialized fluid on the surface of our eyes) into a smaller space – thus this swallow layer of fluid gets “deeper” for a few seconds. This extra “depth” reflects light more effectively – so the eyes appear to twinkle. To give the greatest twinkle, light must be positioned behind the viewer (e.g. you). The source of the light may certainly influence the twinkle as well. If it is too bright – as very often is the case – it will cause the pupils to contract – thus detracting from the “twinkle”. A candle’s light source has the advantage of being dim (so as to engender larger pupils) and dynamic. This constantly changing flicker adds considerably to the twinkle-effect. And you wondered why candles were romantic?! The takeaway? If you want your eyes to sparkle, be authentic when you laugh and smile…and do so in a dimly lit restaurant! Just like clothing, jewelry can either match or clash with the wearer’s underlying skin tone. So before choosing a colored gem (or even degrees of diamond white), it’s critical to define your particular skin tone. Undoubtedly you’ve heard of skin tones being either “warm” or “cool.” But what does that mean exactly? How can you find out what category you fall under? Simply put, skin with a warm hue has a yellow undertone whereas those with a cool hue have a blue undertone. Look in the mirror and hold the white fabric under your chin – then repeat with the cream fabric. Look at the clarity of your eyes and see if you can see them light up. If you are warm, the cream fabric should give you a warm glow, while the white will make you look drawn. If you are cool, the white fabric should give you a glow, while the cream colour will make you look drawn. Simple enough, right? Of course, its easy enough to draw a logical conclusion when applying this rule to jewelry and skin tone. Those with a warm skin tone tend to work better with gold jewelry whereas those with a cool skin tone are better suited to silver jewelry. Of course, these are loose guidelines. If you’re a warm toned gal who simply loves silver jewelry, don’t let these “rules” stop you. Only you know what truly looks and feels best on you…and that’s what matters the most. Vaseline helps your perfume last longer? A flash card for mascara application? Rubber bands for easy nail polish opening? A dryer sheet for staticky hair? These smart little beauty hacks remind us all that beauty can (and should) be easy and simple.